Mary Shelley’s novel Frankenstein (or as it was known back then The Modern Prometheus) was first published anonymously in 1818. The second edition of the novel was published in France under Shelley’s name in 1823. Reviews on the novel were mixed, not helped by the author’s anonymity. One review described it as “a tissue of horrible and disgusting absurdity “. In 1910 the first screen adaption of Frankenstein was made by Edison studios and directed by J. Searle Dawley. The unbilled cast included Augustus Philips as Dr Frankenstein and Charles Ogle as the monster. For many years this was beloved to be a ‘lost’ film. In 1963 the plot and film stills were discovered published in a 1910 issue of The Edison Kinetogram. Better news still a print of the film was discovered in the 1970s * and this film is now available in the public domain. * The copy was purchased in the 1950s by a well-known film collector called Alois F Dettlaff. In 1931 another Frankenstein film was made. James Whale was the director, Boris Karloff was the monster and with Colin Clive as Dr Frankenstein. This film is one deserving of its high ranking in all the best film polls. Things to note in this film was that there was no score which in my opinion shows just how well acted the characters were in this film to keep the audience in suspense and the atmosphere in the film leads to a creepy eerie world in which we are drawn into. This movie set the standard for films featuring Frankenstein. Could this film ever be surpassed? To most Universal and horror film experts the 1931 picture was surpassed in every way., in 1933 Universal announced they were to produce ‘ The Bride of Frankenstein ‘ At first James Whale refused to direct the film, he wilted when he was given complete artistic freedom. Boris Karloff and Colin Clive once again returned and they were joined by Ernest Thesiger (who brilliantly portrays an even madder scientist Dr Pretorius) and Elsa Lanchester who stars as ‘ The Bride. The plot from this film follows on from the 1931 movie and in it Mary Shelley reveals how Frankenstein and the Monster didn’t die. In this movie we see the monster as a humanely being craving for love, affection and friendship. Karloff again showed why he was the best in the business at this genre. In particular the scene where the monster meets the blind hermit is cinematic gold. Clive again is terrific, the scene where the Bride comes alive is mesmerizing as Clive exclaims She’s alive! ALIVE! It is a scene that is etched into cinema history. Produced by the well-known Hammer Film Productions, the Revenge of Frankenstein actually stands up as a pretty decent film. The plot involves DR Frankenstein escaping from the gallows and heading for Germany where he continues his horrifying experiments under the guise of DR Stein. This film had many of the components of a Hammer film, the bubbling beakers in labs and the foggy streets. One thing of note from the film is that Hammer co-produced this with Columbia Pictures and couldn’t use similar features and make-up of the Frankenstein films of the 1930s due to Universal’s contractual rights. British actor Peter Cushing took the lead role as DR Stein whilst Eunice Grayson is the female interest in the film, overall one of Hammer Productions best films. Hammer released their 5th Frankenstein film in 1969. This time a decent script enabled Peter Cushing to show off his true talents. The plot stems around Dr Frankenstein and his assistant kidnapping the mentally sick Dr Brandt and performing the first ever brain transplant. 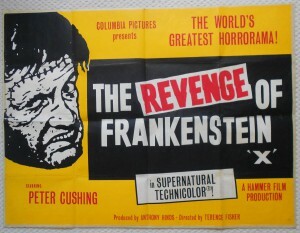 The film has a gothic feel, superbly directed by Terence Fisher and a great performance by Cushing. Both people could be forgiven for just going through the motions as this was coming off the back of a not so good Frankenstein movie. This film ranks as one of Hammers best. Panned by critics and a box office flop (it lost $40 million dollars) this film is a slow melodrama of a movie. Kenneth Branagh directs and whilst he sticks as close to the novel as possible you have the feeling that the cast just aren’t into this film. Going back to the 1931 version where they had no gimmicks, limited effects, no score and you still get drawn into the film whilst in this movie you feel distant to the cast and characters. Robert De Niro tries his best as the monster but it is a casting failure.